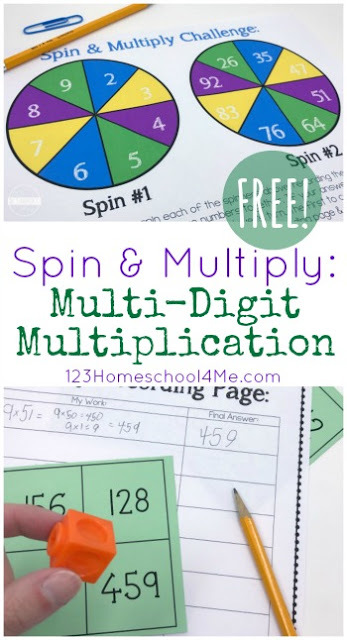 Make practicing multiple-digit multiplication with this fun, free printable, Spin and Multiply Math Game. I was caught off guard recently by the fact that my daughter (third grade) was suddenly learning to multiply multi-digit numbers. I feel like I blinked and we’re already here! Because this is brand new for her, I wanted to make sure we began with baby steps. 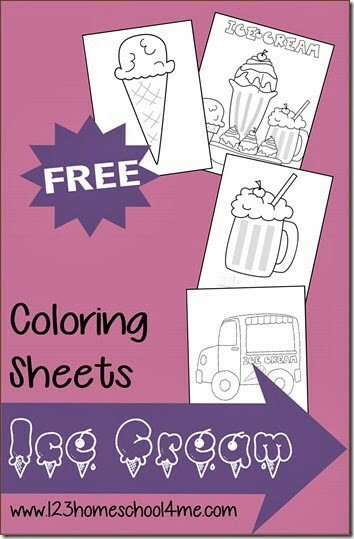 I also created some additional games so we could make practice fun and meaningful! 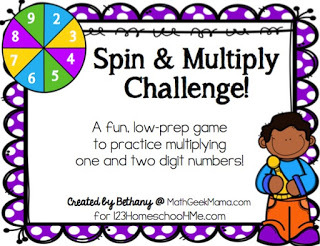 One of those games is the Spin and Multiply Game I’m sharing today! 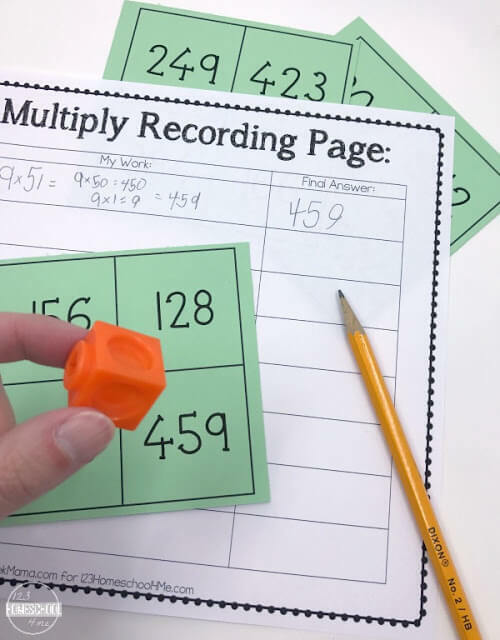 This is a great way to practice multiplying one and two digit numbers with your third or fourth graders. As with any new math concept, I began teaching by reminding her of what she already knows about multiplication. We reviewed multiplication lots of different ways and I made sure she understood place value. Then we looked at multiplying larger numbers using the very same ideas and understanding that she had applied to single digit multiplication. I also made sure to show her and provide practice with several different methods. One example is to teach multi-digit multiplication with area models. Other methods we used include partial products, creating arrays with manipulatives and making a table. Once she had a solid understanding and could determine which methods to use for certain problems, it was time to practice by playing fun games! This game is simple and low prep once you gather all the materials. 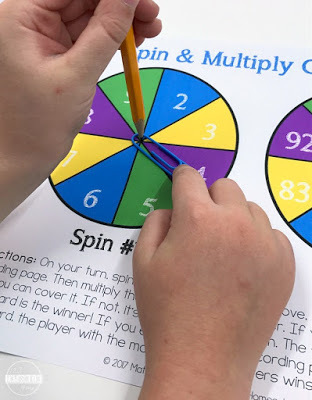 Before you begin, you will need to print the spinner mat, BINGO solution game cards as well as a recording sheet for each player (all included in the download). To assemble the spinner, you can either use a paperclip and a paper fastener brad, or you can do what I do and use a pencil. You will then need some game pieces to cover the solution cards. This can be anything at all: unifix cubes, beads, coins, counters, etc. Or if you laminate the cards, you can use dry erase markers to cross out the solutions. Then simply erase when you’re finished playing! The goal of this game is to be the first to cover all 4 solutions on your BINGO card, or to be the player with the most solutions covered at the end of the game. To begin, the first player spins once on each spinner and records the values on their recording sheet. They then use the space provided to find the solution and record their final answer. If the solution is on their BINGO card, they can cover it with one of their game pieces. If not, it is the next player’s turn. 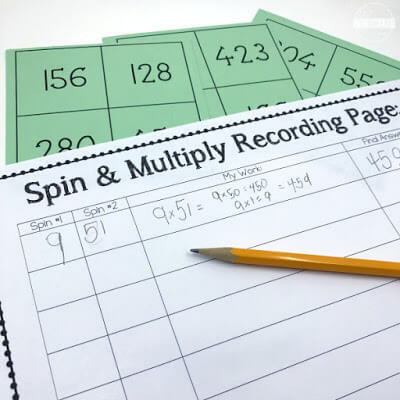 Players continue spinning and solving problems until someone covers their whole board or until everyone completely fills in their recording page (8 multiplication problems). If no one covers the whole board, then after the game ends the player with the most solutions covered wins! 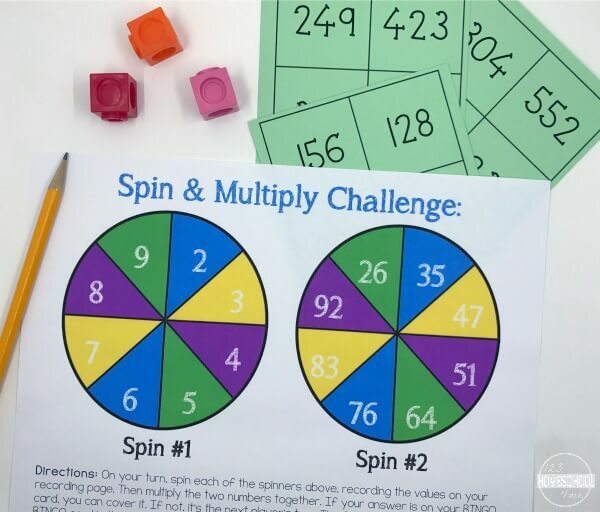 I hope you enjoy this fun, yet simple, game for multiplying one and two digit numbers!